Many participants in the financial markets make their investing/trading decisions exclusively off what is happening with the price of a stock. This strategy is called technical analysis because you are simply using the data created on a chart, and you do not take into account the fundamentals surrounding the company (earnings, growth, economy, etc.). For me personally, technical analysis is probably the least important part of any investment decision I make. It enters the picture as one of many determinants used, and it carries little weight on the ultimate decision. However, it must be part of an investment decision because so many people following the financial markets buy or sell because of what is taking place on the charts. How undervalued or overvalued an asset is means nothing for the direction an asset will move in the next 15 minutes, 15 days or 15 months. As asset will only rise or fall in price when the market collectively decides it wants to buy or sell that asset. Never before. We know that throughout history those that have bought and held undervalued assets while they waited for the market to locate that value have become the most wealthy people in the world. We also know that those that have bought overvalued assets in the hopes that the market would take them higher almost always look and feel great in the short term and end up broke in the end. Does that make anyone feel better in the short term by investing in fundamentally sound countries, currencies or business that continue to fall in price while they watch high flying U.S. stocks with no earnings rise relentlessly every hour? Of course not. Investing is about 10% intelligence and 90% mental strength. Since we know the market carries significant weight on technical analysis we can use it to provide clues to when the moment will occur when market participants begin to "discover" the over or undervaluation within the financial markets (even if we/I do not believe in technical analysis). Writing this now I feel like I could digress into 20 paragraphs on how this applies to game theory within the financial markets, but I will try to stay on track. The S&P 500, starting in October 2011, began its most breathtaking and uninterrupted run perhaps in history. 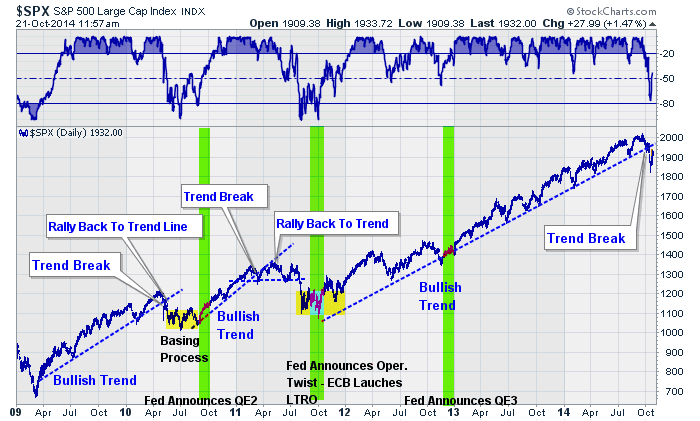 The chart below shows the trend line that began that fall, which was essentially unbroken for three full years. If you were to zoom out on this chart and look at the market over 20 to 30 years, this line looks like a parabolic moonshot directly upward into space. You can see below that last week this incredible trend line was finally broken (charts below from STAWealth). Here is the zoomed in view of the most recent action. The chart labels the trend line beginning on November 2012 but we can see above it was actually a year earlier. The recent decline took stocks below their 50 day moving average, then the 3 year trend line, then their 200 day moving average. 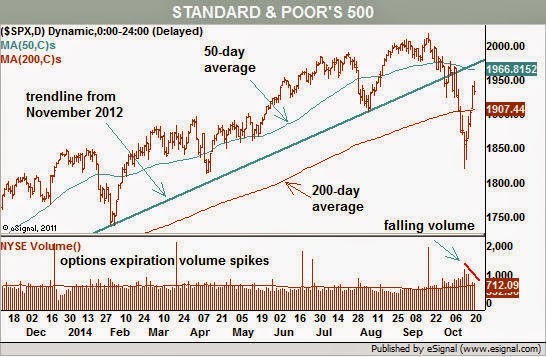 The 200 day moving average was almost immediately recaptured. What does this mean for stocks? For technical traders this is what you would call "damage to the charts." We know U.S. stocks are wildly overvalued and surrounded by extreme euphoria. On the way up, traders have loved the chart and they have bought relentlessly (with the rest of the world). On the way down, as the chart begins to experience "damage," you will see technical traders quickly exit along with over leveraged hedge funds and the new entrants to the party; high frequency traders. This is why I believe the market is more likely to experience a severe waterfall decline on the way down, instead of a comfortable escalator ride. The old saying goes (and it was confirmed by the first drop last week), the bull slowly climbs the stairs and the bear jumps out the window.